Ethiopian Diaspora Day or Give me your Dollar Day? The Ethiopian Airline ‘giving 10% discount for Ethiopian origins who travel to the country to celebrate the first Diaspora Day, according the All Africa sourcing the government owned Ethiopian Herald. The first Ethiopian Diaspora Day that will be marked August 12-16, 2015 in Addis Ababa for celebration is the new strategy of Woyane to divide Ethiopians by bribing us to ignore the struggle and come home spend our dollar and have a good time. The problem is why only 10% discount, why not 40% like EA does for the Tigrayians in Diaspora? According to our source; Tigrians travel to Ethiopia at a whopping 40% discount at any time of the year and we confirmed that by calling the hotline. As shocking as it may sounds; TPLF instigated Federal ethnic regime is playing Russian roulette on the lives of our people but, the apologists keep diverting us to look the other way and tell us to come and spent your dollar and have a good time with the butchers. The question is why all of a sudden Woyane is in love with the Ethiopian Diaspora all over again? I know it is stupid question to ask but, I have to do it anyways. But, first let me say price discrimination for non-Ethiopians is wrong to begin with. Imagine an American Airline giving discount only for Americans and America born only. When that is not enough the Airline discriminate Ethiopians by ethnicity — favoring Tigrians. Obviously the problem are the participating Tigrians not Airline per say. It appears they have been feasting on the expenses of the rest of Ethiopians I am surprised they didn’t call it TPLF Airline or Tigray Airline. If you ask who is responsible discriminating Ethiopians by ethnicity it is simple to figure out. As they say, the fish rot from the head and the head of the Ethiopian Airline is none other than Tewolde Gebremariam. Though the airline was supposed to be the Ethiopian government owned and operated entity it is clear it is TPLF’s cash cow to use it for political and economic activities. Don’t be surprise if the profit goes to EFFORT or laundered out by TPLF operatives. After all there is no government in Ethiopia but TPLF. Quite frankly, if you think about it; there wouldn’t be enough jail space to put TPLF criminals when regime changes. No wonder TPLF apologists are freaking out all over the world when the racketeering ring is slowly crumbling on its own weight. But, it worth to note; TPLF fooled Ethiopians with ethnic Federalism to reap the benefit of ethnic division and run with our money to the bank laughing for so long. The Medias that supposed to investigate are setup as decoy to legitimize and cheer the thieves to the bank. 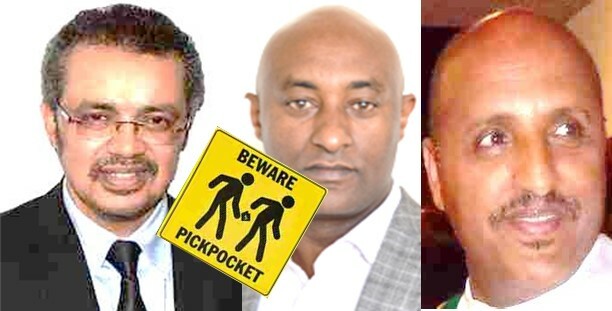 But, Tewolde Gebremariam was not alone pulling the Diaspora day political heist. The Minister of Foreign Affair, Dr Tedros Adhanom and the Ethiopian Diaspora Association’s President Dr. Ababu Minda are in the ploy of the first Diaspora Day or loosely translated give us your Dollar or support Day. The other thing behind the Diaspora Day is to divide the Diaspora again. There would be a free ticket for a lot of cadres for photo-op for the media to show the diaspora love Woyane to confuse the Ethiopians from joining the struggle to end TPLF rule. I can already what the fake Medias headlines would read. The Association that claim founded in 2012 as ‘non-political, non-religious and non-profit association’ according to its website has not done anything worth speaking. In three years. The only engagement the Association claim publicly is ‘The Ethiopian Diaspora Association (EDA) signed Memorandum of Understanding (MoU) with the Ethiopian Community in Kuwait (ECIK)’. According to referendum, ‘the salient points agreed upon were enhancing members’ participation in the areas of investment, trade and tourism, transfer of knowledge and skills, and promotion of the positive image of the country’. It is not clear what the Ethiopian Diaspora Community in Kuwait that left their country in search of job has to do with investment, trade, transfer of knowledge and skills or promotion of the positive image of the country. The expose is not only mindboggling but shows the intricate criminal activities of TPLF operative works out of Ethiopian Embassies beyond the Ethiopian border. The Diaspora Association was formed by Ethiopians that reside in the United State and Europe but it doesn’t have any legal status in US or Europe or anywhere majority of the Diaspora live or anywhere else in the world except in Ethiopia under Charities and Societies Agency. No one knows who is behind the Association not looking at its website reviles whether it is a front of the ruling TPLF regime to divide the Diaspora in the name of investment in Ethiopia. Again, no one knows what the Association meant when it claims a ‘nonpolitical’ while the President says his job is ‘to strive towards the full realization of the vision of the late Prime Minster’. As I described it on the article Dr. Ababu’ is an Anthropologist specializing in Africans migration to East Asia some 500 years ago, as his published paper ‘An Afro-Indian Community in Karnataka, India. You would think a person with a PhD in anthropology would figure out the difference between political and nonpolitical. What could possibly go wrong? Could it be he is a fake PhD as Journalist Abebe Gelaw has been cracking down or a real PhD but, compromised to work for TPLF, you be the judge. At the meantime, the government owned Airline for the first time officially announce it is politically discriminating Ethiopians in collaboration with the Foreign Minister and the Diaspora Association — violating its mandate public owned commercial Airline to finance TPLF’s political activities. Though several Ethiopians reviled Tigrians unofficially get 40% discount from the Airline to travel back and forth to Ethiopia, this will be the first time the Airline in collaboration with the Foreign Minster officially engaging in political activity on behalf of the ruling regime. The CEO wasn’t qualified for the position but appointed because he is TPLF member. But, officially using the Airline for political reason is another front to undermine Ethiopians in the Diaspora that call for boycott. Next time Ethiopians fly Ethiopian Airline they should know the Airline is a ‘cash cow’ of TPLF as the sorry present PM alluded. Therefore, you should know you are financing TPLF atrocities and corruption against the people of Ethiopia. Independent Medias must investigate the Airline and the Association and demand the resignation of the CEO and call for boycott of the Airline and the Diaspora Association until they come clean. It is about time to follow up on every TPLF operatives’ front institutions and officials using the public enterprises for their criminal activities. The struggle must go on in many fronts, waiting for someone else to liberate us is not enough? We must all be part of the struggle to end TPLF rule soon.